However one feels about subway dancers’ high flying antics, we should be able to agree they shouldn’t be arrested. Vagrancy, the offense of a person not being able to prove at a given moment that he or she is employed, was a new and flimsy concoction dredged up from legal obscurity at the end of the nineteenth century by the state legislatures of Alabama and other southern states. It was capriciously enforced by local sheriffs and constables, adjudicated by mayors and notaries public, recorded haphazardly or not at all in court records, and, most tellingly in a time of massive unemployment among all southern men, was reserved almost exclusively for black men. I cite these sources because it’s important to understand the history of criminalizing black bodies for seemingly mundane actions. That seems to be more Smith’s obsession than Bratton’s, reducing these teenagers from people to totemic symbols and ideological props, as though dancing on the trains is some sacred ritual and any attempt to move it to parks or other places people are free to leave proves the NYPD’s secret role as the racist art police. There’s no bigger conspiracy of race, class or culture here. The issue is simply about how shared, confined common spaces can be used. Hearing progressives who adore public transportation and disdain cars insist subways must double as performance spaces makes my brain hurt. 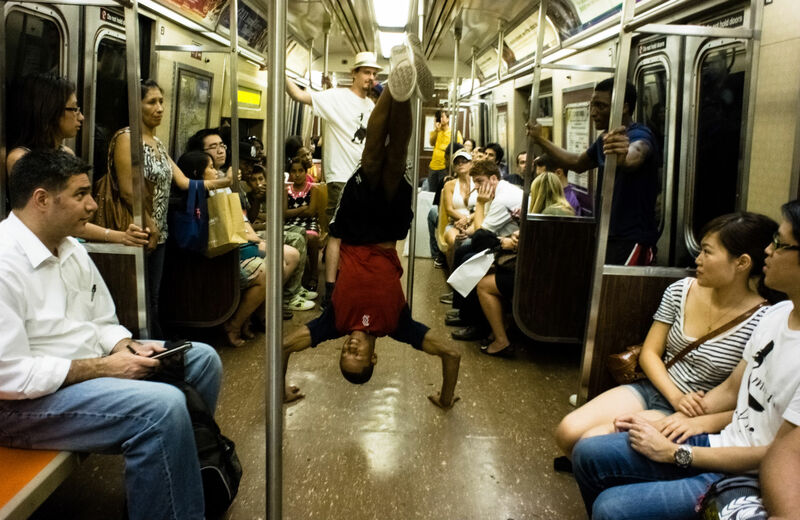 My argument has never been that subways “must double as performance spaces.” I haven’t made a public art argument with regards to the subway dancers, though I’m not opposed to doing so. (I’m also not sure how I put words in Commissioner Bratton’s mouth, as what Siegel quotes I didn’t attribute to Bratton.) What I’ve said is that arresting these mostly black teenage boys is further criminalization of black youth and black bodies, an assertion I continue to stand behind. However one feels about subway dancers’ high-flying antics, we should be able to agree they shouldn’t be arrested. If there are real complaints about subway dancers’ posing a threat to people’s safety, then that’s something the city has to deal with. But the answer can not and should not be to arrest these kids. We can not making dancing a crime (look how that turned out in Footloose). Siegel goes on. “[F]or anyone serious about social justice, there’s no shortage of pressing work. The NYPD continues to arrest an excessive number of young black and Latino men and burden them with criminal records for marijuana even though they’re no more likely to use it than their rarely hassled white and Asian peers—and even though New York State actually decriminalized personal possession decades ago.” I agree. Saddling young men of color with criminal records for possession of marijuana is abhorrent. But their being arrested for dancing isn’t somehow better. We are a nation addicated to solving social problems through punitive measures that serve no one, least of all those already burdened with a history of second-class citizenship. We should be limiting the contact between our youth and police. The way to do that is not to criminalize a harmless behavior—and after all, even Siegel concedes that “the dancers haven’t actually injured any riders.” They’re not simply being asked to move elsewhere. They are being arrested and charged with misdemeanors. Does that seem “light”? Well, the stakes are always higher when black people interact with the police—on any level. Ask Nubia Bowe from Oakland. Siegel concludes: “With so much worth fighting for, why are so many fixated instead on the unhindered right of young men to dance on trains and then ask riders for change or a buck or two? Is that really all they think these talented, entrepreneurial teenagers are capable of?” Sounds like “soft bigotry of low expectations” argument, but Siegel misses the point. Whether or not dancing on the subway continues isn’t my biggest concern. These kids are unequivocally talented, and I would love to see them be able to practice their art with the full support of their community and their city, in whatever space that may be. My issue is that we’re arresting them. We are continuing to police black bodies under the guise of public safety, but all we do is criminalize otherwise benign behaviors and punish black youth. That’s a historical arc that hasn’t bent anywhere.